Kat's 9 Lives: Mirage Las Vegas : SO MUCH BETTER! Paradise! After having fallen from grace, it was a relief that we were changing hotels after Monday when our friends left. Mango and the Coconuts left early that Monday morning and we hauled ourselves to the Mirage. One thing that upset us was that the room wasn't ready, which was fine, and they told us that they would call to let us know when it's ready. They never did. We wandered around exhausted and waiting to feel the sweet relief of a nice soft bed! Finally we were able to check in and we walked all the way to the back to take the elevators. OH MY GOODNESS! This was a much better deal! For $77 or $88 a night, which was a lot cheaper than the Luxor, it's awesome! I will definitely come back to the Mirage to stay. It was so nicely decorated and designed. The light shone in brightly unlike in the Luxor where it was so grim and decrepit. Tofu and I in unison agreed that the Mirage was heads above the Luxor. Not to mention that their pool is wonderful. I took some shots from outside and around the pool area as well as around the hotel. It's a pretty nice hotel and the pool looks so inviting. Of course the Venetian is better but for the price I paid it was not bad. I guess you can say that Mirage is like middle to higher ground. 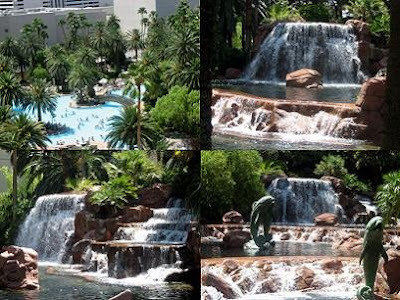 Look for deals online if you are planning to go to Vegas. Going on the weekdays is a better idea to avoid the rush and get the best deals. I now recommend the Mirage and definitely not the Luxor.